Product Support Information and Ordering Help. Alarm Lock Trilogy Locks: Setting up basic system account for the DL-Windows Software. Other Support Documents click here. What is the difference between Fail Safe and Fail Secure electric door strikes? All electrified locking devices fall into one of two categories. They either need power to lock, or they need power to unlock. The original terms for these conditions were fail safe and fail secure. Fail-secure means that if the power fails, the door remains secure (locked). Fail-safe means the opposite: if power fails, the door is unlocked. The confusing part of the wording is in the word “safe”. You might not feel safe in a protected space if the doors unlocked during a power failure, but if the doors “failed safe” you would not have to worry about getting out of the building. Failsafe locks need power applied to the lock to remain locked. A failsafe lock opens and unlocks the door when the power is removed by an access control system or a power outage. Fail-secure locks need power applied to the lock to remain unlocked. A fail-secure lock locks the door when power is removed by an access control system or a power outage. There are applications where only one type of lock is acceptable, mostly for life safety reasons, like in a stairwell of a high-rise building. There are other situations where either will work, but one type is better suited for the application than the other. In general, fail secure locks are more common. At least if the power fails to the lock, your door is not suddenly open to the world. Batteries can be used to provide temporary power to some kinds of fail secure locks, but there are life safety codes in some municipalities that limit their use in many situations. Note: The door hardware trade term Lock or Locksets is not just referring to a hardware item that has a cylinder and uses a key. It is a general term for Door Knobs, Door Levers, Handlesets and Deadbolts that latch (hold closed) and/or lock. How to determine the handing of a door lock? Stand Outside the room or building facing the door. If the hinges are on the left side of the door, the door is Left Hand (LH). If the hinges are on the right side, the door is Right Hand (RH). A lock which by reversing the latch bolt, may be used by either hand (left or right). How to measure backset size? Measure from the edge of the door to the center of the hole or the lock body that you are replacing. Most backsets are either 2 3/8" or 2 3/4". How Chose the correct lock function? Lock functions control the flow of people through a building. Here are a few examples. • Keyed Entry or Entry Lock: Uses a key to open the lock from the outside so you can gain entry to space. Some entry locks use cards or push buttons instead of keys. • Privacy: Locks but has access to unlock from the outside via a small hole or slot to insert a simple tool. Privacy locks do not offer security. Used on bedroom and bathroom doors. • Patio: Lock from the inside and block entry from the outside. They cannot be unlocked from the outside. Note: Do not use Patio function lock on balcony doors where it is the only way into the building. • Passage: Latches door closed and does not lock. Used on hall and closet doors. • Dummy: Single Dummy for one side of the door. Double Dummy for both sides of door. Used as a door pull or for matching the trim. Most commonly used on the inactive door on double doors. • Storeroom: Outside lever/knob fixed, entry by key only. Inside lever/knob always unlocked. • Store Entry Double Cylinder Lock: Keyed cylinder in both Outside and Inside knobs. Key in either knob locks or unlocks both at the same time - for Entry doors with glass near the lock including inside office rooms that require security. 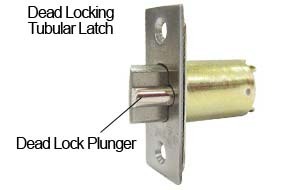 • Communicating Double Cylinder Lock: Keyed cylinder in both Outside and Inside knobs. Key unlocks its own knob independently - for doors that require Keyed security on both sides. • Institutional Double Cylinder Lock: Both knobs are Fixed with Keyed cylinder in both Outside and Inside knobs. Entrance by Key in either knob - for doors that require Keyed security on both sides. The active door is the one that opens first and to which the lock is applied. The inactive door opens only after the active door and is locked in place with Flush Door Bolts or Surface Mounted Door Bolts. In the U.S. most doors are 1-3/8" or 1-3/4" thick. Most standard door hardware is manufactured to fit 1-3/8" - 2" thick doors. Some manufacturers have extension kits or will build a lock to fit a thickness over 2 inches. A typical residential interior door is 1-3/8" thick and an exterior door is 1-3/4" thick. Interior and exterior commercial doors are usually 1-3/4" thick. How to choose the type of cylinder and keying preferences? You can choose how you want your locks to be keyed. •Keyed Alike: If you buy more than one lock, they can all work with the same key. •Keyed Different: Each lock will have its own key that will not fit the others. •Single Cylinder: Is controlled by a key on the outside and a turn knob on the inside. •Double cylinder: is controlled by a key on both the outside and inside. Normally used where you have a glass next to the lock, as it can be broken and unlock if a turn knob was there. 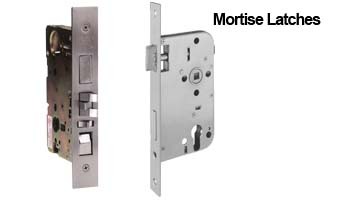 Do I have a standard latch or mortise? This is the most common type of latch/lock found on doors in the U.S. They are used on most standard pre-drilled factory doors. You may not recognize the entire part, but the Latch Bolt should look familiar to you, as it sticks out the edge of a door. Higher security latch bolt incorporating a plunger that is held in a retracted position when the door is closed, preventing it from being slipped open (by a credit card). Usually on keyed levers and knobs. Lock designed to fit in a cavity that is approximately 7" long by 2" to 6" deep in the edge of the door. The metal plate that receives the door bolt or latches when the door is closed. Strike Plates come in many shapes, styles, and sizes for different applications.